Slievenahanaghan is the 852nd highest place in Ireland. Perhaps in the past Slievenahanaghan had otters or some other creature connected to it? I saw neither lake monsters nor lake otters when I set out to stroll up the access road (D 13269 21727 A) referred to by Harry Goodman in his post. There are now 20 turbines on the slopes and at the summit. The good news is that all of the warning signs described by Harry Goodman prohibiting access have been removed, and there only remains a plea not to block the access gate. The access road passes directly under a couple of the turbines and it was a bit disorienting to stand beneath one and watch the massive blades cutting through the air as it swooshed directly down towards me. The blades must be over 40 feet long each, although they don’t come within about 60 feet vertical distance. It was still a relief to quickly move on. This access road eventually curves around the back of the hill so it was necessary to head off the track uphill to cross the bog to the summit. There are many drainage channels in the area to be negotiated, and a sturdy fence to cross at the summit. 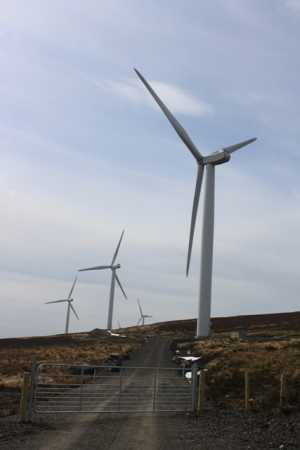 The summit itself is as described by others – an unremarkable area comprising of turbines, service tracks and little else. I particularly enjoyed the view of the nearby Slieveanorra Forest which is quite extensive. An army helicopter was buzzing back and forward over the forest when I was there last Friday. From the summit I made a beeline SE down to the first turbine on the access track and completed the whole walk in about an hour.